I don't think that will be usefull but in case of, actually on the Japanese PS Store , digital version of Stella Stage is at -40 %. I'm aware of the odds, by the way i'm in fan leveling so i'm not in the block situation for the moment. I just looted my 2nd S Costume yay . Just a small edit to encourage people trying to platinum this, in the end you'll success . Of course when i try to focus them they don't drop ^^. Since last time i've 4 fan's letters dropped. Each of them was for the leader of the band at drop time (named). Each of them gave 500 fans. Small echantillon but it seem it's always 500 fans ^^. I finally beat the last DL song resisting me , i guess i'm not good at this ahah ^^. So now i need to A->S the 10 low leveled idols + their events and max the (they are between lvl 55~68 and 550k~750k fans from their S tiers), Lvl10 6-7 base songs and of course loot each S dress/costume (-1) and accessories (the worst part). I think i'll focus on stella stage once everyone is 99 ^^. I received Stella stage (and started it ^^) and the code inside (for a theme) worked on the same tool we use to add yen to our account so i'm now sure these codes are expired , kind of sad ^^. Actually i only have the S dress from the DL Content, i'm about 10 Gold box but no luck for a S Dress . I only have 1 girl at S(lvl 75) for the moment but they all grow really quick ^^. 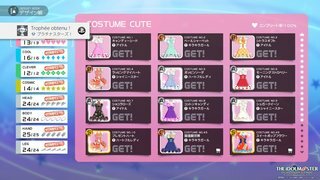 The DLC Content 1 dress (i love this one ...) really unlocked me for a lot of event ^^. There is something i never catch , it's the letter you receive in box. I guess this increase fan or money or "affection/trust" but i never seen any difference. Someone know the true behind these fan's letters ? Hi there , sorry to revive the subject but I have some questions regarding Platinum stars nowadays. First thanks to everyone, this topic was incredibly helpful when i started the game ! 1 ) I've a version come with two code on it, I tried to enter the codes where we insert the codes of Playstation Store cards but without success. I guess they are expired or i miss something ... Can someone help me to clarify this point ? 2 ) Is there any option to skip the "DL Content Focus" each time you come to menu ? I know i can pass it with option button but i dunno if there is something about that in options ? 3 ) Concerning the Tailor , with 5 Gold ticket are all items elligible or only basic content items ? 4 ) On the account stats screen there is a envelope with a line you can select in a dropdown list, as titles in most games.What the point of doing it ? 5 ) For the Valentine achievment do you need to keep the chocolate of each girl , or just have it even if you use it immediatly ? 6 ) I'm used to play "Go my way" and "Ready !! ", i read a lot of times that Kiramekirari is the better song to beat the scores. Is there any block point in the game where you're forced to play "Kiramekirari " ? 7 ) I play on my european account on my european system, i've a japanese account i used to download the catalog and some demo.If i add Yen to account via PS Cards will i be able to buy the dlc ? (It seem yes but i'm not totally sure ^^). 8 ) I actually want to buy some dlc song, more again since i read they are Stella compatible but to be honnest i find them really expensive.Do you know if there have been any reductions in the past on these DLCs ? Welcome Center / Re: AnhP , nice to meet you. Hi Naryoril, thanks for your greeting . Yeah i've read a lot about this frustrating loot system , but i'm kind of a completionist so i guess i can't do anything but trying. The kind of people who was collecting gatchapon in shenmue ^^'. Actually i've loot only 3 Gold Boxes (and 3 accessories on it ^^) with about 69 hours (probably not more than only 20-25 played, i'm used to do several things in same time). I plan to play both P.S. and Stella Stage in parallel. You're right ! I waited too long hoping for an at least English version. And seeing the VR thing on store made me sad ^^'. Welcome Center / Re: Where are you from ? Welcome Center / AnhP , nice to meet you. Hi , i'm AnhP ! I'm kind of new in the Producer's Team , I'll do my best ! I'm from France and to be honest my english isn't good and my japanese is near of null , sorry for that. My first meet with Im@s was Idolmaster 2 (with a evil version :-(), i played some hours but was too lost and abandon quickly. I've play a little bit to 3 Im@s Mobile game but not really hardly (i will say in cumulative time about 60 hours). Finally i recently (December 2017) took the train of Idolm@ster Platinum Stars (late you say ? ) with a really cheap imported limited version and i'm actually chasing for the platinum trophy (i'm far far far from it ahah). Actually this forum helped me a lot about the looting system , but i have again tons of question about this opus ^^. Last week i ordered Idolm@ster STELLA (late again ? nooo ... well ok ...) but it will take some time to find the way to my producing studio ^^. So i choiced to join this community hoping to be able of non-useless comments . Well ... this close my producer introduction, may we let's shine our idols . Page created in 0.348 seconds with 23 queries.